Synergy is a tool that can be used to share a keyboard and mouse across multiple computers. 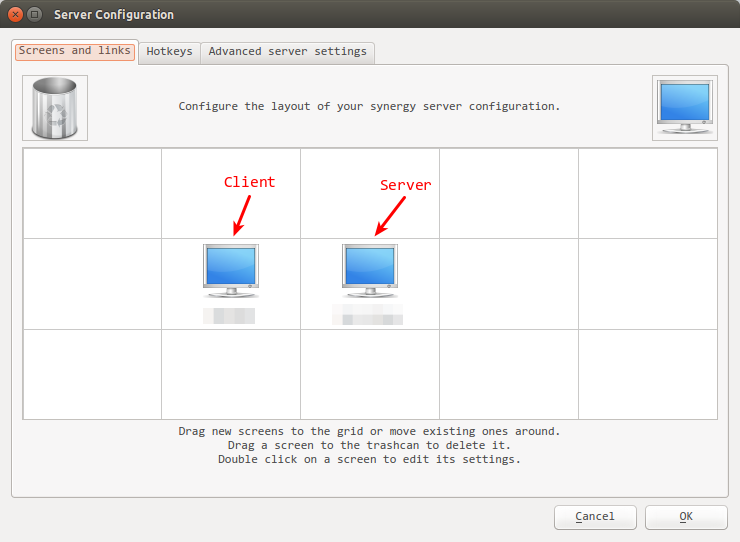 In this post, I will describe how I used Synergy to share a keyboard and mouse between two computers running Ubuntu. Server is the computer whose keyboard and mouse you want to always use. Client is the computer whose display you want to control using the server’s keyboard and mouse. Make sure the server and client are connected on the same wireless network or LAN. Make sure you can ping the server from the client and the client from the server. Type Synergy in the Dash or synergy at the shell to open the GUI of Synergy. Choose the Server option. Choose an encryption method from the dropdown and provide a password. In the main dialog, make sure Configure interactively is chosen. Click on Configure server. In the Screens and links tab, you should be able to see a blue display, which represents the server. Drag down the blue display (in the top-right corner) to a box neighboring the server display. This new display you added represents the client. My client display on my desk is to the left of my server, so I dragged the blue display and placed it to the left of the server display. Double-click on the display you added. In the Screen Settings dialog, provide a Screen name to the client. This can be anything, it is just used in the grid of displays. Add an alias: you have to give the hostname or IP address of the client here. Click Start to start the server. It will minimize to the system tray at the top. Choose the Client option. Choose the encryption method from the dropdown and password that you had used on the server. They have to be the same! Remember that I have placed my client to the left of the server in the grid. So, when I want to switch to my client display, I hit the mouse to the left side of the display on my server. It will appear in the client! All the keys I type on the server keyboard now appear in the client. To switch back, hit the mouse to the right side of the client display.